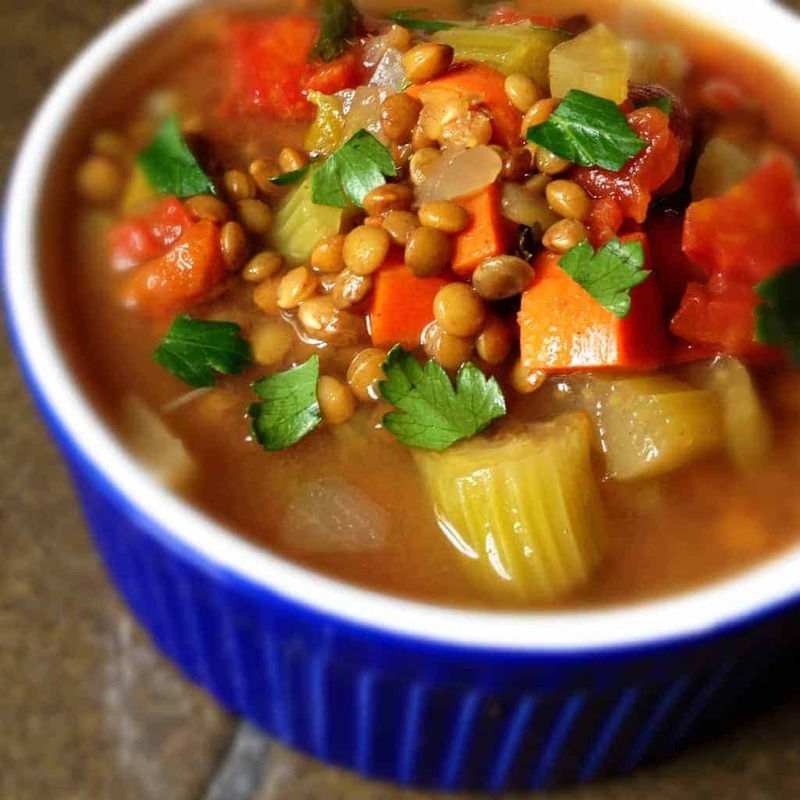 Bacon adds a smoky, salty flavor to this easy and delicious slow cooker lentil soup full of veggies, protein and fiber. The hectic holiday season and everyday life as a busy work-at-home mother of a toddler practically begs for easy and delicious slow cooker recipes. If you accidentally had cookies for breakfast, lentil soup will give you a hefty dose of much needed protein, fiber and nutrients. Smoky bacon, fire roasted tomatoes and smoked paprika all provide richness and depth of flavor without many additional calories. As always, make it your own! Diced white or sweet potatoes would be a great addition to make it a bit heartier. Don’t have any fire roasted tomatoes? Regular diced or whole peeled work just fine. Want to dial down the heat? Skip the chili pepper flakes. In a frying pan over medium-high heat, cook bacon slices until brown and crispy then remove from pan and set on a plate lined with paper towel to drain. Add all ingredients including the cooked bacon to the slow cooker and heat on Low for 8 hours or High for 4 hours. Salt is left out of this recipe due to the bacon, canned tomatoes and chicken broth used. Feel free to add salt if you prefer. Want more delicious slow cooker dinner ideas?? Head over to my Pinterest board for ideas! If you are going to give nutritional fact per serving, it might be a good thing to say what the serving size is. Also, light grey text on an off-white background is cruel on people with poor vision. I plan on making this on Sunday for the week. Haven’t tried lentils yet and I figured the best way to try them is with BACON!!!! LOL. I do have one question…do you know if this will freeze well? I’m omitting the tomatoes because I can’t eat them but including all other ingredients. Yes this freezers really well! Very good basic recipe; I increased the lentils to 1.5c. Instead of bacon, I used 5 andouille sausages that had been browned, braised, then chopped in large chunks (omitted the chili flakes and canned tomatoes, but would use the tomatoes again). I used the sausage braising liquid along with the chicken stock. During the last 1/2 hour, I added chopped kale. It was excellent! So glad you loved it and made it your own!! This is very similar to a recipe I make regularly, though I do not use a slow cooker but just a normal pan and on a low heat. I alwasy tend to vary it slightly but the main ingredients are all there. I vary the begetables according to what is in season. There is something about the “gravy” that green lentils make but I often use a mixture of red and green ones. It tastes delicious with grated cheese on top and seeved with warm crusty bread, home made garlic and olive oil bread, or even chapatis/tortillas. Such a great idea!! Thanks for your thoughts! Please make my previous comment 5 stars. It wont let me. Thank you so much – I so appreciate it!! I actually made this recipe tonight. Delicious! I didn’t have any fire roasted tomatoes so I just used plain whole ones chopped. Just threw it on the stove, no crock pot. Didn’t expect it to cook as fast as it did. I bet it will taste even better tomorrow. If there are any leftovers. =P Thanks for sharing this yummy recipe. I am so glad you enjoyed it!! It will absolutely taste even better the next day – enjoy!!! This crock pot soup sounds fantastic!!! Oh my, this looks good! Can’t beat a healthy, hearty soup — especially if it’s got lentils AND bacon! Yum. Liz! I haven’t tried lentils yet!! What is wrong with me??? This looks totally amazeballs and probably has so much flava! Yum! You’ve gotta get on the lentil train sista!! So filling and good! Happy Holidays! I have been allll about lentils lately. They are so hearty and healthy. Who doesn’t love a slow cooker kind of day. This is the kind of soup I need in my busy holiday season :) I would love the lentils in it, and my husband would be super please that bacon is involved…it’s a definite winner! This soup looks INCREDIBLE, Liz! I want a bowl right now. Looks & sounds amazing! Will be making this real soon. Thanks for the recipe! You had me at slow cooker. Wait. Lentil. No. Bacon. Yep, bacon! Looks so stinking good! LOL!!! I love it. :-) I hope you get to try it – so good!!! Yum! I love lentils. And I really need to use the slowcooker more. This is perfect – I feel good just looking at it. I’m banking on losing 5 pounds just by looking at this recipe. Think I have a chance?